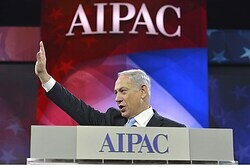 Prime Minister Binyamin Netanyahu addressed AIPAC’s 2014 Policy Conference in Washington D.C. Tuesday and began by bringing “greetings from Jerusalem – the eternal, undivided capital of the State of Israel” – to a standing ovation. Specifically, Netanyahu focused his speech on describing what he said was the “moral divide” which separates Israel and her enemies. The Prime Minister received rigorous applause as he described his visit to Israeli field hospitals treating Syrians injured in that country’s civil war. He described how a mother and child were “blown to bits by Iranian bombs” fired by the Assad regime, and how patients voiced how they had come to realize that they had been “lied to” about Israel for decades by their leaders. “In a Middle East bludgered by barbarism Israel is humane, Israel is compassionate, Israel is a force for good,” he said, contrasting Israel’s humanitarian efforts worldwide to Iran’s support for terrorism and oppression of its own people. “The only things Iran sends abroad are rockets… and terrorism, to maim and kill innocent people,” he declared. Quoting Hezbollah chief Hassan Nasrallah, Netanyahu described the “moral divide” between Israel and Iran. “Iran and Hezbollah love death, and Israel loves life. And that’s why Iran and Hezbollah will win, and Israel will lose,” he quoted Nasrallah as saying. Netanyahu also emphasized the threat posed to the US specifically by Iran, noting that whilst the Islamic Republic already had missiles which could reach Israel, it was building longer-range Inter-Continental Ballistic Missiles (ICBMs). The purpose of those missiles, he said, was specifically to target America. “When you see Iran building ICBMs, just remember America – that Scud’s for you!” Netanyahu quipped. “Leaving Iran as a threshold nuclear power would deal a death-blow to nuclear non-proliferation,” he said, warning the audience to look beyond the “smiling faces” of the regime in Tehran. “If we allow this outlaw terrorist state to enrich uranium” he said, it would “open up the floodgates… a Pandora’s Box of nuclear proliferation throughout the region… and the world. “Letting the worst terrorist regime on the planet to get atomic bombs would endanger the world, and certainly Israel,” he continued – and Israel would not let that happen. For a diplomatic deal with Iran to work, pressure should be strengthened, not relieved, he cautioned. “Greater pressure on Iran will not make war more likely, it will make war less likely,” by showing the international community was serious. Just as Israel is prepared to recognize a Palestinian State, “the Palestinians must be prepared to recognize a Jewish state,” he demanded. Such a recognition is not a symbolic gesture, he explained, but a clear statement that the PA was prepared to end the conflict for good, as opposed to simply restarting it at a later point with new claims, such as an attempt “to flood Israel with refugees”. “Recognize the Jewish state – no excuses… it’s time!” urged from the podium. But could take years, even decades, for such a formal recognition to filter down to the Palestinian street – which is precisely why Israel needed long-term security arrangements even after a final agreement. In addition, any agreement would immediately come under attack by Hamas, Hezbollah and other radical groups, he predicted, which was why only “the Israeli army, the brave soldiers of the IDF” could be trusted to secure Israel, as opposed to international forces whose permanence cannot be guaranteed under fire. Turning to the movement of to boycott Israel – the Boycott, Divestment and Sanctions movement (BDS), Netanyahu said that the movement is standing “on the wrong side of the moral divide”, and was bound to fail. BDS attempts “don’t seek a solution of two states for two people… but the dissolution of the only state of the Jewish people,” he said, noting the movement’s own openly-declared opposition to the State of Israel’s very existence. Urging the public to “reject the BS in BDS”, he called on “those who wear the BDS label” to be treated in the same way as any other anti-Semites. “The boycotters should be boycotted!” he said, as the boycott movement was motivated by pure hatred. BDS, he quipped, stands for “Bigotry, Dishonesty and Shame”, and those “gullible fellow travelers” who believe BDS helps the cause of peace were actually pushing peace further away by helping to harden Palestinian positions. The Israeli Prime Minister ended by addressing the audience directly. The address follows a meeting yesterday with US President Barack Obama in which Netanyahu received praise for his diplomacy with the Palestinian Authority. The Prime Minister himself took the opportunity to call on the PA to live up to its commitments under international law.